U.S. tight oil production increased in 2017, accounting for 54% of total U.S. crude oil production, in part because of the increasing productivity of new wells. Since 2007, the average first full month of oil production from new wells in regions tracked by EIA’s Drilling Productivity Report (DPR) has generally increased. These growing initial production rates have helped tight oil production to increase despite slowdowns in drilling activity when oil prices fell. The average new well in each DPR region in 2017 produced more oil than wells drilled in previous years in those same regions, a trend that has persisted for nearly ten consecutive years. More effective drilling techniques, including the increasing prevalence of hydraulic fracturing and horizontal drilling, have helped to increase these initial production rates. In particular, the injection of more proppant during the hydraulic fracturing process and the ability to drill longer horizontal components (also known as laterals) have improved well productivity. This increasing well productivity has supported tight oil production even in years such as 2015, when crude oil prices fell and rig counts dropped. In 2016, rig counts continued to decline sharply and total tight oil production decreased for the first time in 10 years. 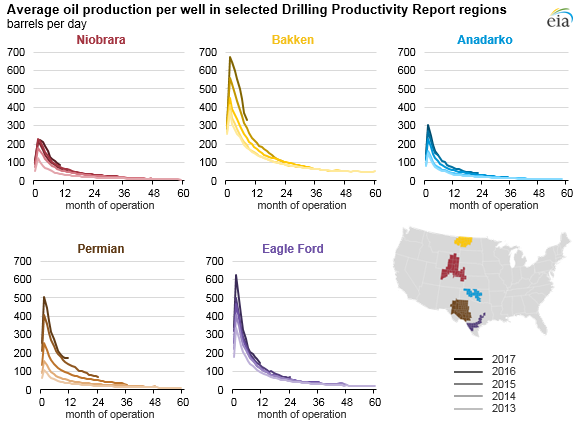 Fewer wells were drilled; however, those that were drilled were drilled more quickly and located in more productive areas, which led to increased per-well production and profitability. As rig counts continue to recover from decreases that occurred during 2015 and 2016, producers have increasingly targeted the Permian region, which spans parts of western Texas and eastern New Mexico. The geological structure in the Permian region is more complicated than in other regions, and it took producers more time to advance the drilling and completion technology in the region. However, the Permian region is larger and has more potential for oil production than other regions. Total production and production per new well have increased in the Permian for 11 consecutive years.